It was last year when I first read/ discovered about 802.11ax on one of the websites mentioned below as references. Ever since I tried to collect more information and wanted to write about the same. But every passing day/ week/ month, I learnt a new aspect about 802.11ax. Being from Telecom Industry and Radio background, “throughput/speed/data rate ” makes us go ga-ga. Even if anyone ask us difference between 802.11ac vs ax or 3G vs LTE/4G first thing we point out is higher speeds. But honestly, 802.11ax is much more than only speed. It is complete evolution or shall I say the moment for Wi-Fi Industry. When I started reading about MulteFire, LTE-U/LAA in the same spectrum, was bit worried about Wi-Fi and future as Wi-Fi as technology was designed for neutral environment and didn’t have sophisticated Interference mitigation from external sources. Then came the moment with 802.11ax, the features have made me believe again, Wi-Fi is here to stay and would play greater role in Future Networks, more than enterprise and indoors. 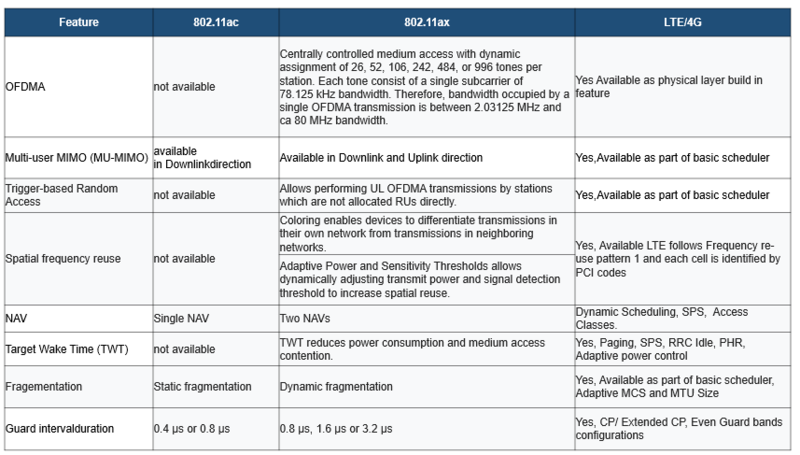 Table showing key features and comparison between LTE, 802.11ac and ax. With 802.11ax, we have OFDMA, RU ( resource units) , optimizing existing orthogonal frequency-division multiplexing (OFDM) digital modulation scheme that 802.11ac already had, the 802.11ax standard further assigns specific sets of sub-carriers to individual users. Similar to Resource blocks/Resource Elements in LTE. Also borrowing from modern LTE terminology, the 802.11ax standard calls the smallest sub-channel a Resource Unit (RU), with a minimum size of 26 sub-carriers.Hence support scheduling of more users at same time. Frequency Re-use/ Color Coding of BSS vs PCI in LTE/ ICIC solution: Currently STA ( station) performs CSMA, Reads if the medium is busy or not, even if tte STA detects 802.11 frame from other AP it consider medium busy. But with 802.11ax there is color coding associated with every BSS. If the BSS color in the detected PPDU is the same color as the one that its associated AP has already announced, then the STA considers that frame as an Intra-BSS frame else Inter-BSS frame. This can be considered as PCI ( Physical Cell Identity ) for LTE/4G network. Once detected actions such as TX power optimization or scheduling can be performed. We can even design ICIC solution for Wi-Fi. Power Saving and Target Wake up time/RRC Idle mode with Paging: Most of us uses Wi-Fi with our portable devices hence battery is very critical, along with that it is very important for AP/Network to schedule / manage users. With this feature access point can manage to mutually agree with devices to define activity time and sleep time, hence saving network and user resources. Consider this similar to Paging, RRC Idle time. Triggered based Random Access/ Random Access in LTE: Similar to random access for connection and scheduling resources, this avoid collision and helps AP to manage more users at a time. Dynamic Fragmentation: As discussed in our last blog, Packet size does play an important role in Delay, Packet-loss and hence overall user experience hence this feature shall work wonders for real time applications. Extended Guard Band : Similar to LTE ( CP/ Extended CP) helps better management of Delay spread and Multipaths. Other important features are MU-MIMO in both Downlink and Uplink Direction which are more of ideal case scenario as they require a lot of pre-conditions such as regular feedback reports coming from users, user mobility, simultaneous users can be non-coherent which Ideally for outdoors and hyper dense networks are not possible. Beam-forming: Again has lot of limitations, processing and conditions attached to it, never the less very important feature for stationary and specific use cases. Higher Modulation: Theoretically yes 1024 QAM but practically very limited area /small coverage and not feasible. But yes where it does make sense is with 802.11ad deployment cases such as P2P backhaul links. http://www.ni.com/white-paper/53150/en/ : Probably one of the best papers on 802.11ax basics.